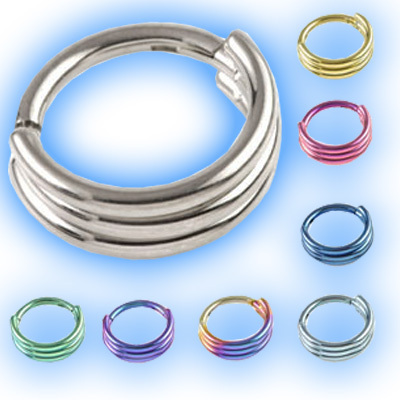 Banded Titanium segment rings for 16 gauge (or 1.2mm) body piercings with an easy fit hinged segment. These unusual solid Titanium rings give the look of 3 identical sized bands but the part that passes through the piercing is only 1.2mm thick so that they can be worn in many different piercings to give an edgy look. They are available with a choice of 3 internal diameter sizes - 6mm, 7mm or 8mm and 15 different Titanium colours - highly polished, bronze, brown, blue, ice blue, yellow, gold, peach, pink, purple, 2 tone purple blue, teal, green or even rainbow. Just as pictures. Love it! Advantages: Titanium. Custom coloured. High quality. "Fantastic company. Great prices, fast postage and excellent products. Only place I buy my body jewellery!" "Best and fastest service of any website I've ever been on, Recommend this site to everyone. Full star rating from me. Hard to search for exact body..."
"Fast, efficient and professional as well as helpful!" "Order arrived really quickly as usual, I needed to return a couple of items as I'd ordered the wrong size, this was done really quickly too with no..."
"Fast efficient service, and good price. Would recommend"